This is a super great recipe and family favorite. Whenever I take it somewhere I am always asked for the recipe. I found it several years ago in my 15 year old Better Homes and Gardens cook book. It is simple to put together, requires no baking, and tastes like a thick, yummy piece of fudge. I have played with this basic recipe adding a capful of mint extract to the chocolate filling and a few drops of green food coloring to the cool whip on top to making a great grasshopper pie. 1. Mix the sugar and butter together for 4 minutes, until it becomes kind of frothy. 2. Add the cocoa and vanilla and mix for about 1 minute. This is what it should look like at this point. 3. Add the eggs one at a time. Mixing for at least 2 minutes after each egg is added. The picture below shows what it should look like after all the eggs are added. 4. Spread the mixture into the Oreo crust. 5. You can put the cool whip on any old way you would like. Depending on how fancy you feel that day! I used a Pampered Chef tool to pipe it on in thick swirls. You can either shave a chocolate candy bar over the top or dot the cool whip with chocolate chips. 6. Refrigerate for at least an hour, but it's best if it stays in the fridge over night. This pie also freezes really well. Enjoy! This looks DELICIOUS! 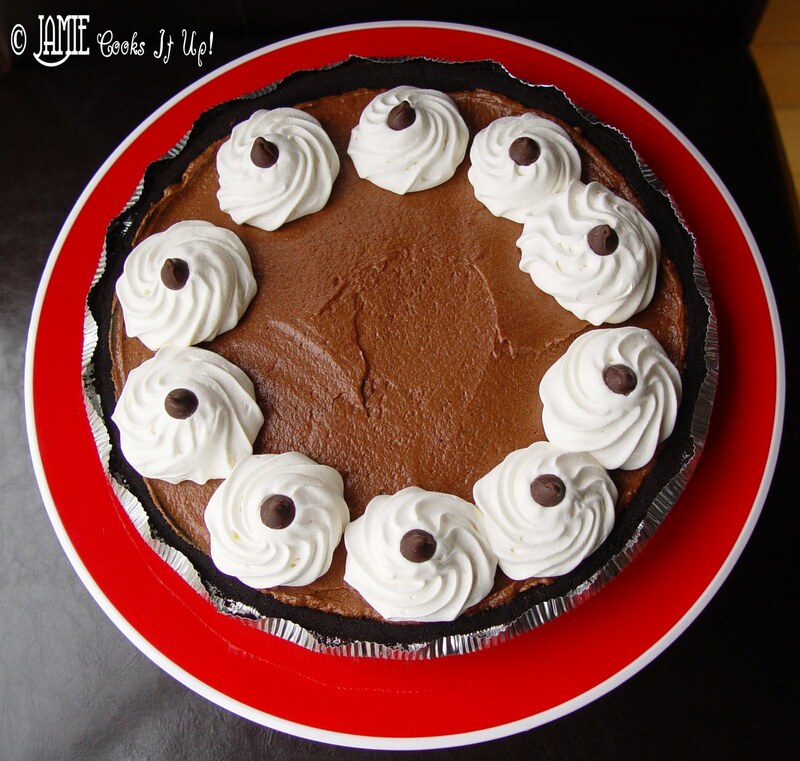 I've never made a french silk pie, but this really makes me want to give it a go! So happy that you like it. I plan to do more blockquotes as soon as I find time. BTW, I never did fiurge out how to do archives so that you are reading chronologically from top to bottom. Did you? I made it and it was super easy and delicious!!!! Very rich however super good! The only thing I would do differently is, make my own whip cream because the Redi Whip did not keep its shape and got a little milky. Oh, I must make this but with homemade whipped cream (there's nothing like it! YUM!). 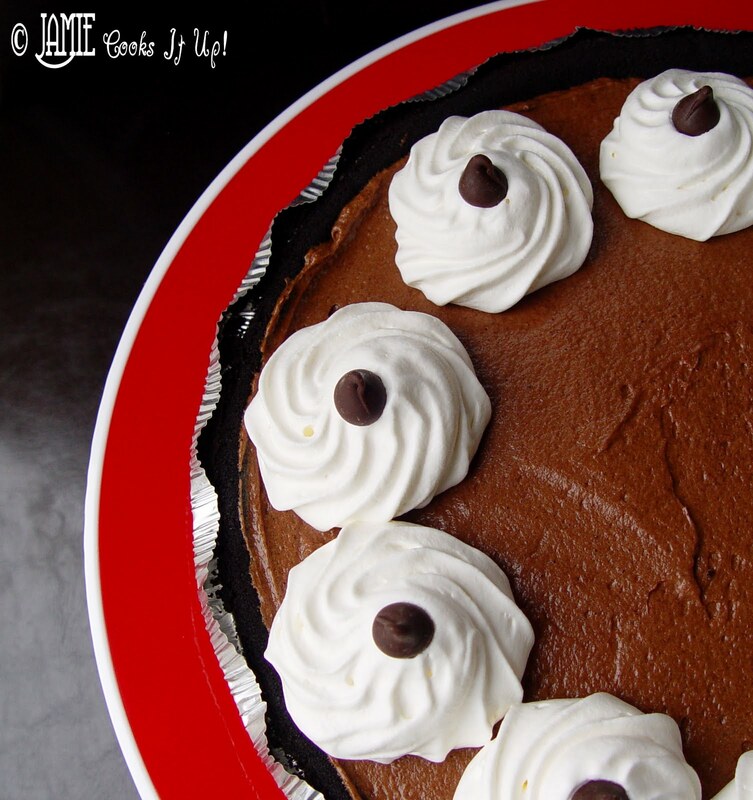 I love how you decorated your pie. Wow. Now I have a chocolate craving. Look delizioso, questa torta è molto invitante. Ciao Daniela. I made this as a surprise for my step mom who can't have gluten or dairy, cause all day I was making stuff that had both gluten AND dairy. So I made it and my dad told her and she was so surprised I had made something for her, and she took a bite and could tell every ingredient that was in it xD That's my step mom for you. But she really liked it 😀 Good recipe! I'm a little concerned about the raw eggs. Any insights? I've never had a problem with the raw eggs, as long as you use a good pasteurized egg you should be fine. A fellow blogger did a little bit of research on this recipe. You can read her findings here. This pie looks great! I've been looking through the pie recipes to get ready for Thanksgiving, and found that the grasshopper pie and pecan pie links are saying page not found. Thought you might like to know!! Thanks! wanted to say that I’ve truly loved browsing your weblog posts. In any case I will be subscribing in your rss feed and I am hoping you write once more soon!